Our classes are for people who want to have fun! Geeks, freaks, actors, moms, dads, kids or anyone who wants to truly feel empowered. People who want to find the hero inside themselves and step up in character. Folks who love to use their imagination and are interested in hanging out with other saberists, actors, cosplay players, and Con-attendees. We are not teaching a “Martial Arts” nor “Fencing” class. 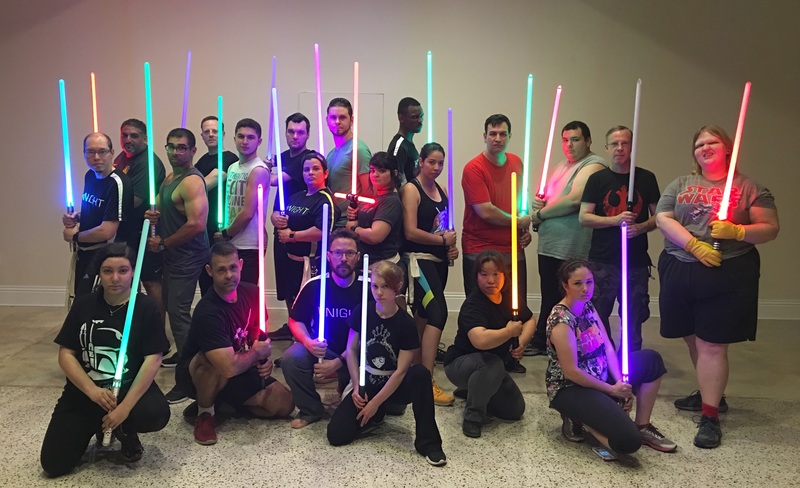 We are teaching how to clash sabers and make it look good! There is no need to buy gear like a helmet or gloves. The best part about is that because you’re not bashing each other on the head, this is not an all-boys club. Our classes are equally 50% women and 50% men breaking any taboo or “norm”. Swinging sticks recklessly will end up with someone getting hit in the head or worse. Rather than just swinging wildly, we teach you how to duel with others in a systematic way that makes it more competitive as it binds you and your partner to specific combination of moves. Most actual fights in real life end in 2 moves. Staged Combat choreography tells a story. It is what lures us in when we watch a movie that has duelists. We want to see the spins. We want to see the drama and the split second hits. That’s what this class is about. It’s for students looking to play out a beautiful scene that tells a narrative and told through words, movement and the drama all while using a system.